Looking for something different and unique in a residential elevator? 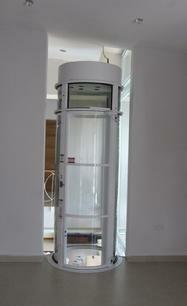 Try the Pneumatic Vacuum Elevator which uses AIR to move it. It does not use any more energy than your washer or dryer and comes in 3 different models. The PVE 30 (1 person, 350 lbs. ), PVE 37 (2 person, 450 lbs., and the PVE 52 (3 person, or 1 wheelchair, 525 lbs.). The Pneumatic Vacuum Elevator is certified by the ASME (American Society of Mechanical Engineers). It does not require a shaft, pit, or machine room. Travels up to 35', up to 4 stops, with in line or straight thru openings. The elevator uses a polycarbonate tube which uses a vacuum pump to generates areas of higher and lower atmospheric pressure within the cylinder hoistway with a vacuum pump. A set of mechanical locks anchor in the elevator when it reaches each floor. The system has built in safety mechanisms to stop a free-fall in the event of a power outage, which allows the elevator to slowly descend to the ground floor. PVE 30 Technical Specs. PVE 37 Technical Specs. PVE 52 Technical Specs.